On this date, Albert Bierstadt made a bold move, mounting an unauthorized exhibition of his paintings, The Discovery of the Hudson and A Scene in the Rocky Mountains, in the House Chamber. In 1866, Bierstadt had begun a campaign to have two paintings commissioned to hang in the Capitol. This idea met with favor, as landscape painting had become the preeminent American genre, and Bierstadt was among the most accomplished and well known landscape painters. In November of that year, it was reported that Bierstadt, “the great American landscape painter . . . will be commissioned this winter to paint pictures for two of the panels in the Representatives Hall in the Capitol.” Shortly thereafter, a resolution was successfully introduced to authorize the Library Committee to contract Bierstadt for two paintings representing a prominent feature of scenery or an important event if the discovery of America. The trouble came with securing an appropriation. Bierstadt was asking for $40,000 per painting, a sum far exceeding the most recent commission. 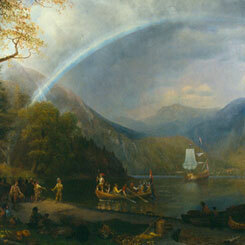 The resolution languished until March 3, 1875, a few months after Bierstadt’s very public unauthorized exhibition, when The Discovery of the Hudson was finally purchased for $10,000.